The race to create the best "connected home" system is in full swing now, especially with new, serious competition from the likes of Amazon. As such, it's hard to be surprised by a new report from the Wall Street Journal that Google's parent company Alphabet is considering merging Google and Nest again. Unfortunately, the sources who relayed the information don't give much more information than that. TechRadar asked Google for a response, and Google merely replied that it declined to comment. Google and Nest — a home automation company — were split in 2015 following the creation of Alphabet, only a year after Google bought Nest for $3.2 billion. Apparently this type of independence hasn't been working out as well as planned. 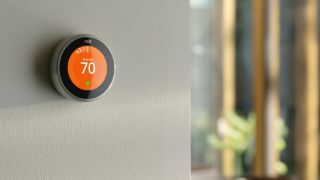 The seeds of the rumored merger were already in place last year, when a number of Nest employees were brought over to Google to integrate voice commands with Nest's thermostats and camera feeds. A closer relationship could mean we'll see more and better connected home systems in the future, and better communication between the two entities could push us toward the reality of a voice-controlled home sooner than expected. For Google Home, Google Home Mini and Google Home Max, a merger with Nest could lead to advancements across Google's smart speaker lineup. Nest reportedly has around 1,000 employees, but there's no word as to how they might be affected by the merger.